My name is Jared Hager and this website is dedicated to everything travel and vacation. My wife and I will be reviewing products, services and anything having to do with traveling and vacations. We are your stereotypical family. We have 3 kids a dog and a cat. Budgets are tight so we are always looking for ways to find a good deal for traveling and If we do have to spend a good amount of money we always want to make sure we are getting the right deal. Taveling and spending money on vacations can be very stressful. We will be telling you of our experiences and our honest reviews of travel products. My name is Jared. I am married to my awesome wife Brynne and we have 3 children together. We love to travel and go on vacations. We are really big fans of the mini vacations which a lot of people like to call the local or stay cations. I am having a hard time keeping up with all this terminology but I think you get my point with what I am saying here. I’ll be honest you, we are pinching our pennies every month and trying to find ways to save a couple extra dollars her and there. 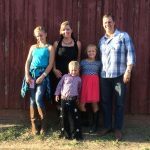 We want to do fun stuff with our family and create awesome memories for our kids. But a lot of times we are limited by our budget. So we have to get creative. What is so awesome is that the more creative we get usually the more fun we end up having. Don’t get me wrong, I would love to rent a $5,000 or $10,000+ a day yacht in the Caribbean for two weeks but that is not in our deck of cards right now so we have to get creative and make every dollar count. We also have family that live all over the country so a lot of our traveling has to do with going to go see family that live in a different state. We currently live on the West Coast which is where Brynne’s family lives but all of my family is in the upper Mid West. So we have done car trips and a lot of plane rides across the United States with our family. We are used to traveling with a large crowd. We know our way around an airport which means we know what to do with strollers and where all the play structures are at airports. We are also very savvy when it comes to entertaining our kids when they get bored. 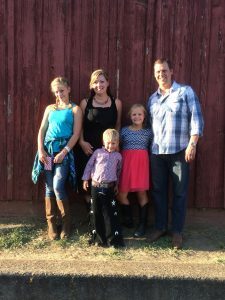 I am from Oregon and we as a family really love to camp. We have camped at many different places across the state and we have our favorites and our not so favorite places. We have learned many lessons along the way and as a young couple all we had to do was throw a tent into the car, go to the store and buy chili, hot dogs and beer and we would be good for the weekend. Now as we have gotten older camping has gotten a lot more complicated especially with 3 kids. We now need more than one tent and now that my wife and I are older we have found out that the deflated air mattress in the morning is very uncomfortable and annoying to fill back up in the afternoon. We have now resorted to renting an RV or travel trailer when we camp. We can’t quite afford to buy one ourselves so renting is perfect. If you want to rent an RV like us read my page on renting an RV in Portland Oregon. I go over how we go about doing it. Renting the travel trailer really made our last trip a true luxury for us. That is not what made the trip a really good one. It really helped but it was not the main reason why. We camped in a really run down place in Eastern Oregon. We were about 3 hours from Portland which is good because it’s never really good being close to a big city. 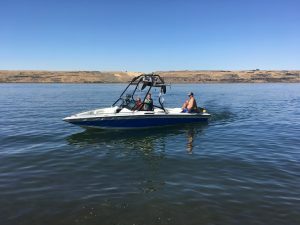 We were on the mighty Columbia river so we were near water which in my opinion is always a necessity when camping because you can always find something to do on the water even if you don’t have a boat or anything. We stayed in an RV park so we had hook ups for the trailer which is awesome. What really made the trip awesome was being with a bunch of friends and family. 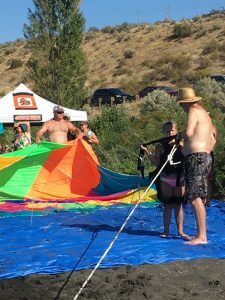 It does not matter where you are camping, as long as you are surrounded by a bunch of friends and family you are going to have a good time. And our friends also had a bunch of kids so our kids had an amazing time since they always had someone to play with. What really made the trip was one of our friends had a ski boat which meant the kids spent hours tubbing and learning how to water ski. With all that activity the kids had no problem falling asleep at night which is always a win for us. The highlight was the boat owner has it set up to parasail behind the boat. He has his own parachute and process of doing it. He has been doing it behind his boat for years. Two of my kids got to parasail for the first time and it was a really amazing experience for them. What really made Labor Day memorable was the look on the kids faces as they were doing all the fun activities. What is even better is the talk on the drive home. They were all still so excited about all the fun they had and asking us if we are going to be going back next year. What really made the camping experience amazing is having the trailer to retire in at the end of the night. I love laying down on a bed inside a structure that protects you from the elements. We are definitely going back next year and I am going to try and rent the same trailer we did this year because it was absolutely perfect for what we need it for. Whenever you get a chance go out and enjoy nature by camping in it definitely go for it. We had an amazing Labor Day weekend. For the past umpteen years we have been camping with some really close friends and their family in Eastern Oregon. We are from the Portland Oregon area so to drive to a really small town and go camping is a really big deal. We have been going to this event for years and we always camped in a tent and I have no complaints about doing that. But as we get older and our family gets larger tent camping gets more difficult. So for the second year we rented an travel trailer or as some may like to call it an RV. When renting an RV or travel trailer in Oregon you have many different ways of doing so. Check out my page on Oregon RV Rentals to see the best ways and places to rent an RV in Oregon. 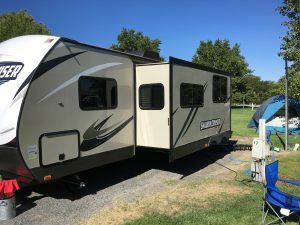 Renting a travel trailer has been a game changer for us. It makes everything so much easier. All we do is show up at the campground and a travel trailer shows up gets set up and we get to enjoy it for the weekend. It’s absolutely glorious especially when you see everyone around you sweating like crazy and stressing out about getting their trailer set up and taken down correctly. I know this sounds mean but it’s so nice to know that it is set up of you correctly especially when I know nothing about the whole process. What is really nice is being able to have a kitchen to prepare food. We always have a big communal dinner for two of the nights so to have our own space was awesome. And one of the nights the theme was to make something Asian themed and we won the prize for the most original. We made a desert sushi. What that consists of is a rice crispy treat wrapped in a fruit by the foot with Swedish Fish on top. It was a hit and since there were so many kids on this trip we got all the kids to vote for us. What was really great was to have a place for the kids to go to sleep that was safe and out of harms way and that was secluded so they do not hear all the fun we were having around the campfire. Another great thing about having the trailer was the peace of mind knowing that no matter what mother nature threw at us we would be well protected. We have had years where it was rain and windy most of the time and years like this year where it was blazing hot. With a heater and a roof over our head we are prepared for the bad weather and with an air condition unit attached we are prepared for the blazing hot weather. We actually had an incident where a suspicious car drove through the campground and I was really pleased to know that my kids were well protected sleeping in the trailer as the car went about the camp ground. As you can tell I am a huge fan of renting an RV or travel trailer. I would highly recommend you try it yourself sometime.